Provide comfort for the family of Helen Onsrud with a meaningful gesture of sympathy. Helen Elaine (Blankenhorn) Onsrud passed away peacefully to the eternal Lord and Savior, Thursday January 29, 2019, at Grand View Care Center in Blair, surrounded by her family. Helen was born on June 20, 1928 to William and Mary (Malesker) Blankenhorn in Galesville. She went to Frenchville Grade School and graduated from Galesville High School. She then attended La Crosse Vocational School and became a secretary at Mc Keeth Garage in Galesville. 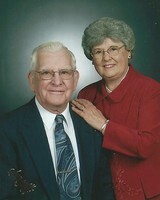 On May 6, 1949 she married Bennett Onsrud at French Creek Lutheran Church. After living in La Crosse one year they moved to Ettrick where they operated the Sinclair Service Station and Garage for 42 years. Following their move to Ettrick she was a bookkeeper at the Galesville Coop until her son Rick was born. She then was a stay at home mother taking care of Rick and Jolene and helped at the station, As the kids got older she worked for Etco for a few years. Helen was an active member of Living Hope Lutheran Church and the Church women’s organizations. She taught Sunday School for many years. She enjoyed her flowers in the summer. Helen also enjoyed their vacation trips to many states, including going to Alaska for their 50th Wedding Anniversary. She was a wonderful wife, mother, grandmother and great-grandmother. She always had a smile on her face. Helen is survived by her beloved husband of almost 70 years Bennett; a son Rick; daughter Jolene Bentzen; grandchildren Heather (John) Betsinger and Ashley Bentzen (Dannon Kolve) and great-grandchildren Justyne, Karina, Gideon and Aleaya Betsinger, and Jaiden and Kiley Kolve; a sister Marilyn Sander, sister-in-law Carol Schulins, Aunt Helen Kukowski and several nieces, nephews and great nieces and nephews. She was preceded in death by her parents William and Mary Blankenhorn, a brother Howard Blankenhorn, brothers-in-Law: Arthur Onsrud, Edward Onsrud, La Verne Benrud and John Sander; sisters-in-law: Myrt Onsrud, Norma Benrud and Doris Blankenhorn. Funeral services will be held at 11:00 am on Saturday, February 9, 2019 at Living Hope Lutheran Church in Ettrick. Rev. Kary Jonas will officiate. Friends may call at the church on Saturday from 9:00am until the time of the service. The family wished to thank the staff at Grand View Care Center for the excellent and passionate care they provided to Helen over the years. They are the best. They also thank the Staff of St. Croix Hospice Care for their excellent care. Online condolences may be left at www.fossumfuneralhome.com. To send flowers in memory of Helen Elaine Onsrud (Blankenhorn), please visit our Heartfelt Sympathies Store. We encourage you to share your most beloved memories of Helen here, so that the family and other loved ones can always see it. You can upload cherished photographs, or share your favorite stories, and can even comment on those shared by others. Provide comfort for the family of Helen Elaine Onsrud (Blankenhorn) by sending flowers.